I'm sitting beside Amanda at the Victoria General Hospital. We're on the 11th floor. It's the chemo floor. She's reclining in a padded green armchair that looks like it's designed for people to sit in all day as they're hooked up to intravenous pumps. That's exactly what people in this big room do. I count eleven of these chairs, plus one bed. There's a separate room at the end of this ward, behind a sliding glass door and a curtain. That room has a bed. She jokingly calls it the "VIP" room. It's for people who get intraperitoneal chemotherapy (IP). That's where we're supposed to be today. IP chemotherapy delivers the cancer-killing chemicals right into the abdominal cavity via an implanted port and catheter. It bathes any remaining tumours or floating cancer cells in deadly fluids, rather than waiting for intravenous chemo to reach the bad guys through the bloodstream. Once she's filled up like an old waterbed, she's turned this way and that to get the killing juice into all the nooks and crannies. Not an iPhone charger - this is an implanted IP port. INSIDE YOU, probably feels like it. Study after study has been showing that each round of IP chemo can extend the life expectancy of a woman being treated for ovarian cancer. Amanda has been encouraged because she's been scheduled to be given the latest and greated IP chemo combos at aggressive doses. But today, she's in that green chair with an IV in her knuckle (yuck! ouch! gross! ), being given drugs that sound like wizards or TransFormers -- Zofran/Odansatron, Decadron. Later her veins will receive carboplatin and paclitaxel. That's not what she was expecting. She was devastated Friday to hear that she would be getting the IV, not the IP. We were here a few weeks ago in that private room at the end of the ward as the nurses tried to poke a needle through her body, on the right side near her last ribs, into a self-sealing silicone membrane, and into a reservoir that should drain into her guts. They numbed her skin a little and pushed the needle in. They opened up a gravity feed of saline and it looked like things were going well. Amanda told them it hurt. It burned. Something felt wrong. They said it was just the saline going in. But it kept feeling worse. The skin around the jab site started to puff up. They realized the needle hadn't made its way into the port, and the fluid was being poured right into her flesh. Docs said it was going into the interstitial space. As much as I've been obsessing over looking up every little part of this, I've not investigated that aspect. I'll just take her word for it that it was bad and hurt. After the first mis-aimed flooding, they tried again to reach the port but came up short. Abandon ship. Day one of IP chemo was aborted and we were rescheduled for another shot the next day. This time they brought in the surgeon who placed the port weeks earlier. She tried. No dice. Tried again. Nope. Another stab. Fail. Imagine having a hockey puck buried a few inches deep in your belly, sewn to one of your ribs, and someone's grabbing and twisting it, trying to lance it with a long needle shaped like an Allen wrench from Ikea. They did it again. Oops, no. One final attempt to get the needle in the port with the guidance of an ultrasound machine was successful. From that point, I'm told it was fairly smooth. A bunch of saline, a bag of chemo, more saline. The equivalent of a whole big bottle of pop, right in her gut-bag. She came home distended and misshapen, but glad to be full of this cytotoxic cocktail. She went back one week later for more IP, and it all seemed to go perfectly. They got the needle in with the help of a Doppler ultrasound, then filled her up, swished her around and sent her home. Things were looking good. But in the past few weeks, there's been some kind of complication. It's a hard, swollen, very painful area somewhere near her port site. I wasn't at the appointment on Friday when the doctor told Amanda that she'd have to stop the IP treatments for now. She was devastated and was not able to interrogate the doctor to get a full understanding of what's going on. She heard enough to understand that the chemo is doing something bad to her good flesh, and that the worst scenario would lead to a surgeon going in and cutting out dead 'good' tissue, skin grafts, and an end to chemotherapy entirely -- bad bad bad. 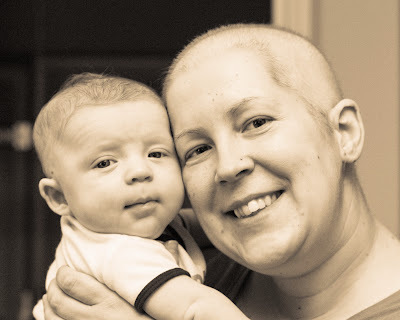 Your first look at Amanda in Chemo Mode sans headscarf, with baby Gordon in Adorable Mode. But if everything goes smoothly from this point on and the problem, whatever it is, corrects itself, she might, maybe, get one extra round of IP chemo. We'll see. For now, we're hunkered down on the chemo floor for another of these all-day IV pumping sessions. The nurses are nice. It's one of the only air-conditioned places in this big, old hospital. I get to have pizza for lunch in the cafeteria. But as pleasant as they try to make all this, we'd both rather be at home right now playing with our baby.